Taking a vacation can be really expensive, but it doesn’t have to be. 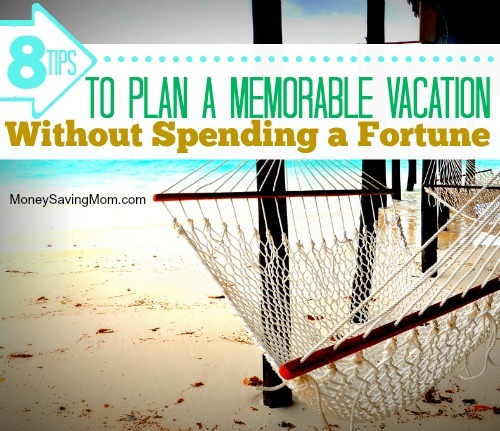 There are ways to take an epic vacation your family will remember and still watch your pennies. I think one of the biggest misconceptions about vacation is that you have to be busy every single minute — you have to plan out each and every minute to ensure your kids won’t get bored. I think another misconception is that you have to spend a ton of money on entertainment while you vacation, and I don’t think that is the case either. I think that if you plan well for what your kids’ interests are, you can go on a very affordable vacation and have an awesome time. 1. Choose an appropriate destination. Choose somewhere that has all-inclusive fun suited to the ages of your children. We recently went on vacation to Orlando, FL, and we stayed a place where there are several water slides (age appropriate for my 6 and 3 year old), mini golf, fun bikes, shuffleboard, and pedal boats. My kids had a blast. We also took a day to go to the beach so they could play in the sand. They loved it. We actually went to the same place a year ago because we had such a great time. We all got to bond as a family and it was perfect. The condo where we stayed cost less than $400 for 3 nights/4 days. We didn’t visit Disney on this trip because I don’t think my youngest will remember it at this age and I want that experience to be memorable for both of my kids. Kids love to just spend time one one one with their parents playing and doing things they like to do. Give your kids your time and attention and I promise you they will remember any vacation you take. 2. Rent a condo instead of a hotel room. Our youngest has food allergies, so whenever we can rent a condo with a full kitchen, we do. It is easier for me to cook than for us to go out and find somewhere that he can eat. Another benefit of a condo is that it costs a lot less to make your meals than it would to go out to a restaurant for every meal. If you like to take a break from cooking on vacation, I totally understand. Even consider eating 2 meals at the condo and going out for dinner. This will still save a ton of money. 3. Consider driving instead of flying. Airfare can be expensive — you can rent economy cars through Advantage, Alamo or another car rental service for about $20 per day (maybe a little more with tax and if you get their insurance). If you are a family of 4, an economy car is all you need. 4. Choose the Economy Car. This piggybacks off the last tip a little, but beware of the upgrades in the rental car biz. The rental car person is a salesman and they want you to upgrade to a cooler, funner car. We rented a 4-door Toyota Yaris for our last trip, and the car was awesome. It had everything we needed. It was brand new, and it was great on gas. There was plenty of trunk space and it was perfect for what we needed. If you have a bigger family, obviously a Yaris may not be in your future, but go with the cheapest car you can for your family. If you are flying, pack snacks that you can take with you. Airport snacks are easily 50% more expensive than buying your own food from the grocery store and taking it with you. You can also bring empty water bottles and fill them at drinking fountains after you pass through security. When you get to your destination, consider making another grocery run to buy a few more snacks for the hotel room/condo and for the trip home. This will save you more money than you realize. Big beach destinations or other popular tourist attractions will be cheaper if you can go in the off season. I know that may not be possible for everyone, but it is something to consider if you can make it work. Check airfare and hotel pricing at different times during the week and well in advance if possible. Also, check Groupon for deals. We usually check Groupon and go through Ebates to get money back. One caution with using Groupon, whenever you buy from them, you will not get a refund so make sure you are positive that is the vacation spot you want and you won’t need a refund at all. 8. Rent a home and vacation with others. If you like to vacation in groups, rent a big house together. This is actually a great way to save money. You split the cost of housing and everybody wins! Taking an epic vacation does not have to cost a lot of money. You can create these amazing memories for your family and still stick to your budget. Becky Wolfe is wife, mom, part-time Physician Assistant, and business owner who has created systems for everyday life chaos and is passionate about helping other moms do the same. She blogs at Simply Intentional Life, where she helps moms meal plan, manage their time and budget.